This compact acrylic display can be placed on a countertop and holds five colour sets of InvisaFil™ Mini Packages. This display is intended for wholesalers to display in a retail store. This compact acrylic display can be placed on a countertop and holds five colour sets of InvisaFil™ Mini Packages. Makes a great impulse buy when displayed at the cash register! Our thinnest thread line, InvisaFil™, is a remarkable silk-like 100wt, 2-ply cottonized polyester. This ultra-fine but surprisingly strong thread has cotton-like characteristics and negligible stretch while also feeling soft in the hand. 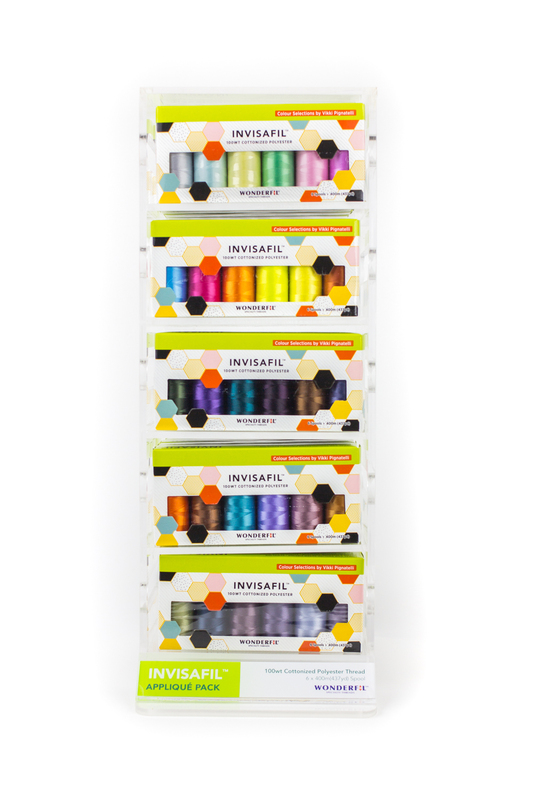 InvisaFil makes for super low bulk stitches and virtually “disappears”, making it the ultimate choice for English paper piecing, delicate lace designs, fine fabrics, creating texture when micro quilting, or whenever you don’t want your stitching to show. It is available in 60 subtle to bright colours with a matte finish, so you can choose how much want the thread to show (or not at all)! Holds: 5 colour sets with 5 packs per colour for a total of 25 packs. Usage: Stitch in the ditch, top and bottom thread, bottom thread for delicate machine embroidery, hand and machine appliqué, free motion quilting, stippling, English paper piecing.